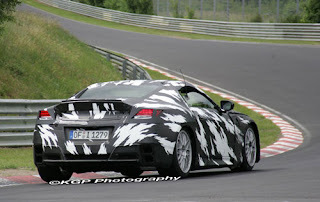 "With one shooter manning a handheld stopwatch, KGP Photography reports the NSX is closing in on the GT-R's 7:29 hot lap, registering a 7:37 lap around the Nordschleife. Eight seconds off the GT-R's best time isn't bad considering this is the NSX's first known visit to the Nürburgring in full production form." The first thing that popped into my head was "The heat is on" song from Beverly Hills Cop. I forget who sings it.